(Newser) – The Republican National Convention will be protested by ... dogs. 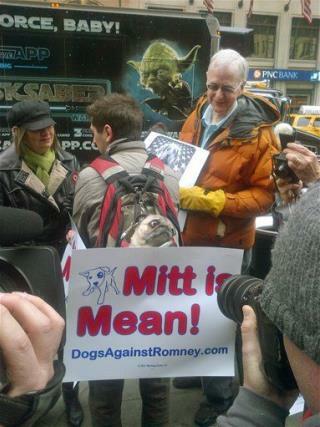 Yes, Dogs Against Romney is planning a Tampa rally Sunday, one day before the convention starts, The Hill reports. "Should we have a president that isn’t even qualified to adopt a pet?" asks the group's founder in a statement, referring to Romney's infamous transportation of family dog Seamus on the top of his car. "Dogs aren’t luggage, Mr. Romney. If this is how he treats a furry member of his own family, just think how this lap dog of Wall Street will treat middle-class families as president." They better be careful since the GOP convention will have a National Guard presence. Their pants are gonna look like Seamus' before the convention is done. They'll "bust Seamus out of his crate"? Do you have to write like an illiterate? My 5th-grade teacher tried to get us all to stop using "bust" for "break" or "burst," and all but the stupid kids were able to grasp the point. Why do you revert and regress now?